In shap six of chula, players can fall into a deep crevasse. 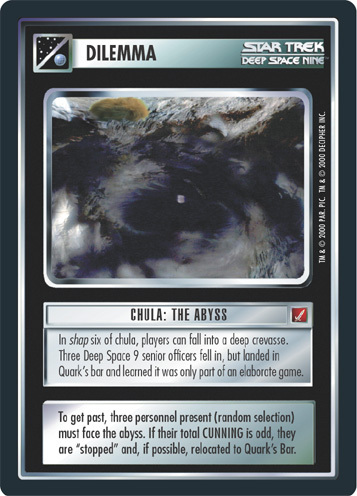 Three Deep Space 9 senior officers fell in, but landed in Quark's bar and learned that it was only part of an elaborate game. To get past, three personnel present (random selection) must face the abyss. If their total CUNNING is odd, they are "stopped" and, if possible, relocated to Quark's Bar.